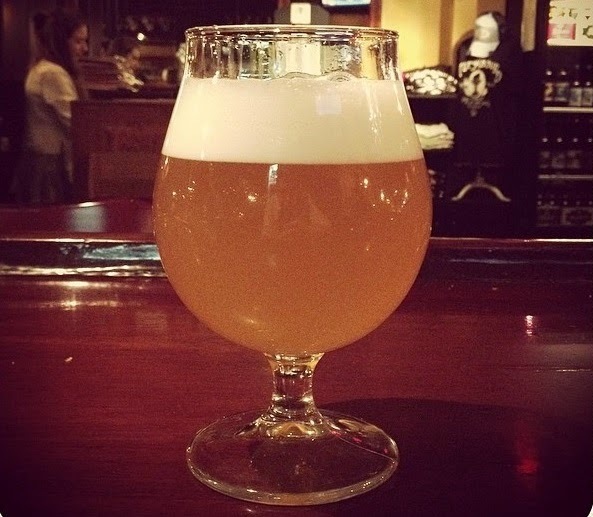 Saison X, first in a small-batch series of saisons, is on tap now at Jolly Pumpkin in Ann Arbor. Image source: jollypumpkina2 on Instagram. More beer news you can use. No pizza for you! You knew it was coming. Starting June 1, the Wolverine taproom is off-limits for outside food. No more ordering pizzas or Chinese from other restaurants. But that's OK because, unless you've been living in a cave, you know that Wolverine now has a kitchen that is turning out some truly delicious eats to go with all that awesome beer. And soon they'll be adding a kids' menu so your rugrats have something to occupy them while you're busy being a terrible role model. Let the sun shine in. Bell's Oberon vs. Arcadia Whitsun? Find out which Michigan summer seasonal is your favorite tomorrow at the Produce Station during Free Beer Friday from 5-6:30 p.m. And check out the great beers coming in via the Produce Station weekly beer update. Feeling a little Territorial? On April 1, both Liberty Street and Witch's Hat are tapping Territorial Baltic Porter, a collaboration brew they made with molasses and cacao nibs. According to Liberty's Joe Walters, "the name is derived from the main road that we take when traveling between our breweries [North Territorial], as well as the characteristic of a certain group of shared 'regulars' that frequent each establishment." In the fall, look for a barrel-aged version. Randall is my homeboy. Also on April 1 Ashley's is taking their new Randall the Enamel Animal out for a spin. At 6 p.m., Dogfish Head 90 Minute IPA will flow throw a nice bed of fresh hops (variety TBD) for an extra punch. And in case you didn't know, both Sidetrack and Red Rock in Ypsi have Randalls now, too. A Series of Saisons. Jolly Pumpkin in Ann Arbor recently tapped Saison X, a refreshing brew with citrus and ginger notes. It's the first in a small-batch series that also includes Saison Y, brewed with juniper and peppercorns, and Saison Z, brewed with raw honey, cacao, and sweet orange peel. Also coming soon: the much-anticipated (by me, certainly) Biere de Mars, as well as Ale Absurd Rye Trippel, which we've not seen in a while. Welcome back, delicious friend! New lawz. Finally the politicians did something relatively useful by loosening some restrictions on small brewers and retailers. The media version of what Gov. Toughnerd signed into law Tuesday is here, and a bit more detail can be found on the state's website.